Today we feature Tony O'Bright, the clinic manager at our Maplewood location. Take a look at Ton'y story below. I’ve known I wanted to be a physical therapist for most of my life. I remember when I was in junior high school we took a career survey, and my results came up that I would be best suited for healthcare. So I took a career explorers course at the local hospital, and I remember when we got to the PT department I was immediately hooked. How great of a job! You get to use all this cool equipment and help people get back to what they want to do. Now that’s a career of importance! Well, after high school I had no idea how I was going to pay for college, so the military seemed like a way to do it. After four great years in the Air Force I was finally ready to start school and achieve my dream! But after four more years and a Bachelor’s of Science in Biology I realized that I needed a break and wanted to start making some money. Three years later as a quality control tech for a large manufacturing company I was at an impasse; I could either keep going along in a job I found boring making a good salary, or I could return to school and gain my degree in what I REALLY wanted to do. I was worried when I started PT school at La Crosse that I wouldn’t fit in. I was already 30 years old, and I knew no one in the program. 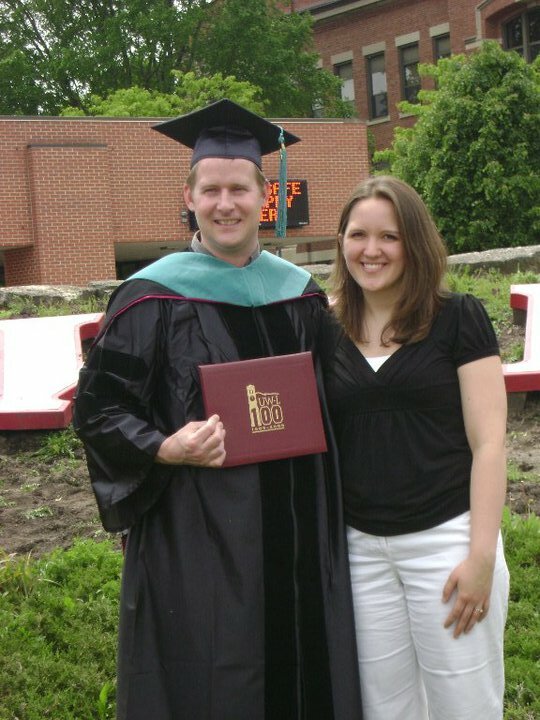 But three years later I had my doctorate degree, had met my wife, and made lifelong friends. Not to mention the career I had always wanted. No regrets for me on the road less traveled.